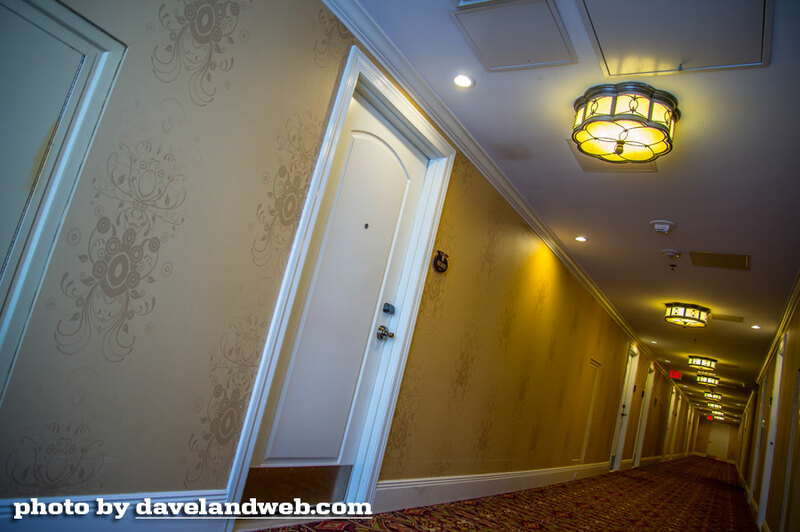 Back to the Roosevelt…no hotel post by Daveland would be complete without a hall shot. My room was gorgeous; spotless and perfectly appointed. 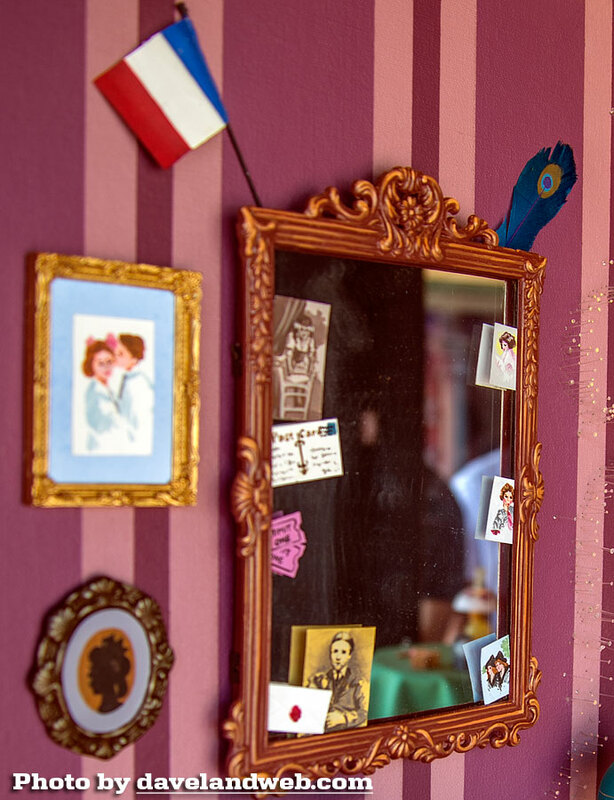 The perfect place to write a postcard home. The furniture chosen was the perfect choice for this hotel. 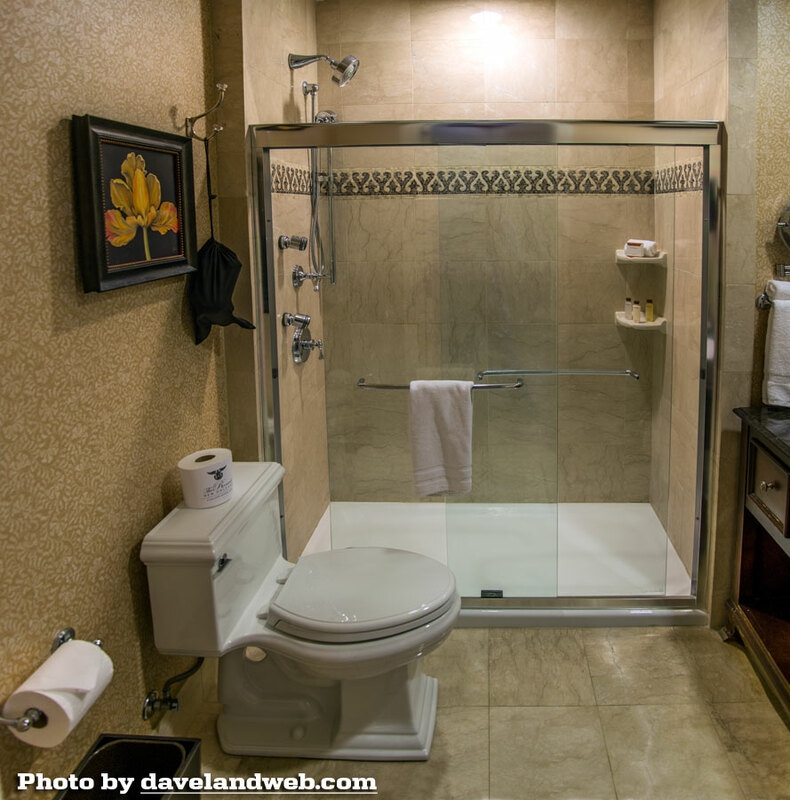 A spacious bathroom, which is where I answered the call when the front desk called my room to make sure everything was ok. How's that for service? 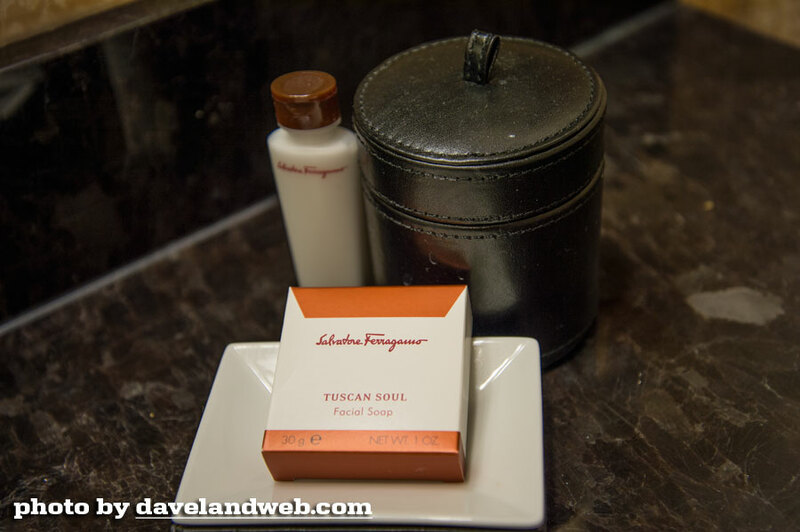 Can't complain about the Salvatore Ferragamo products. Wow! I was living in luxury. 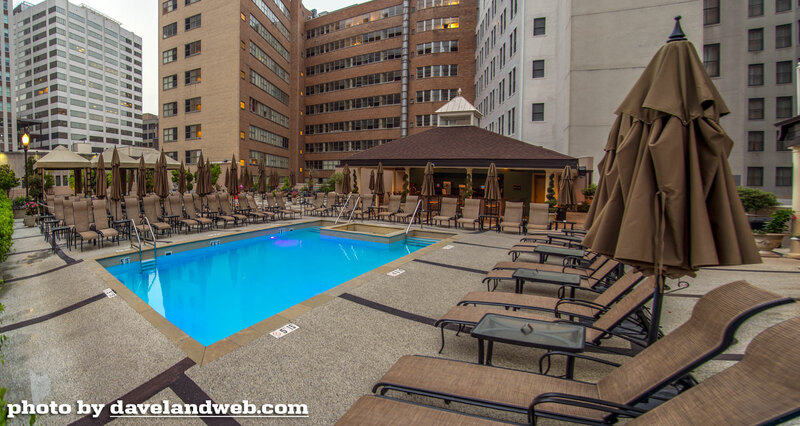 How about that rooftop pool? This area had some great views. The Roosevelt also boasts a number of clubs and restaurants. Here's a shot of The Sazerac Bar, named after the infamous local cocktail. 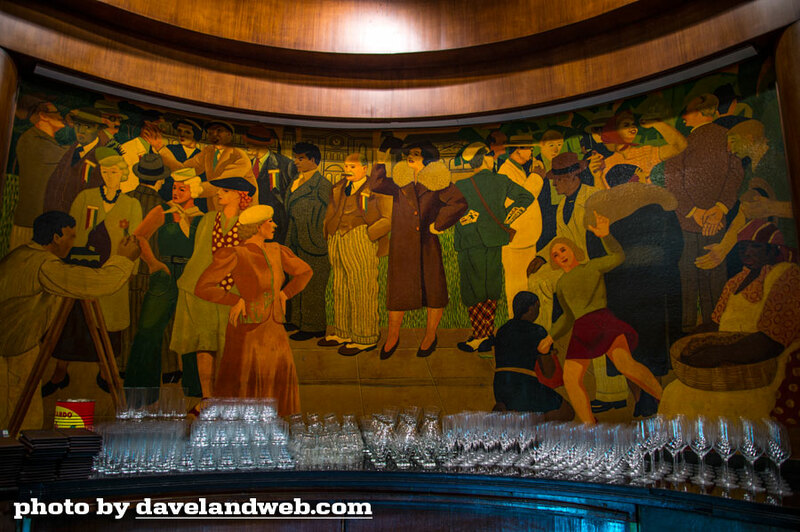 Loved the murals by Paul Ninas; I don't know their origin but if they are new, somebody did a great job with the Depression-era styling and the smokey patina. 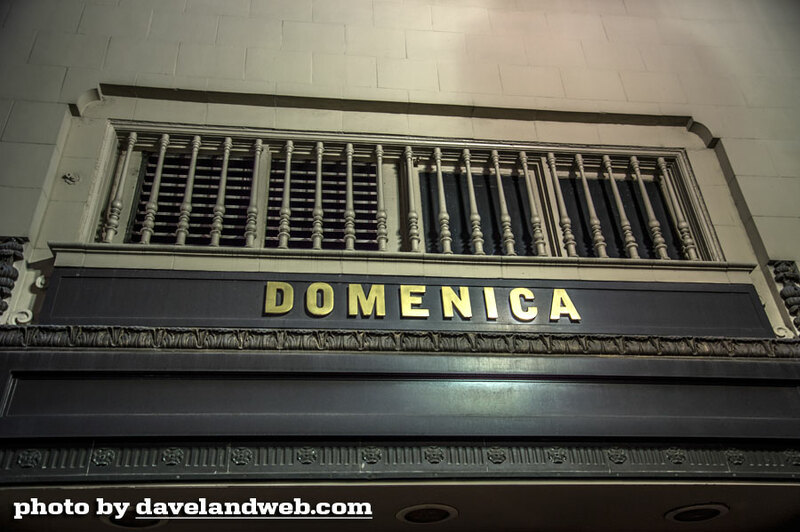 For the one night I had dinner while staying here I chose Domenica. It was an amazing meal. The place was (not surprisingly) packed. 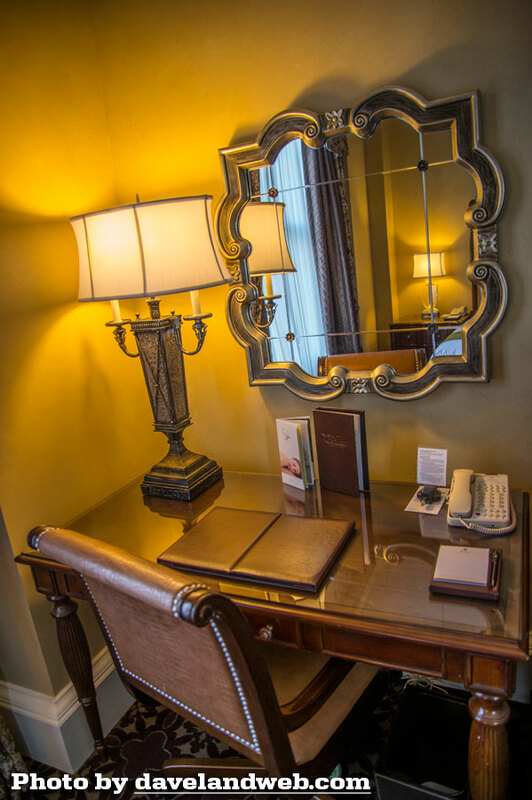 If you haven't booked your room yet, what are you waiting for? 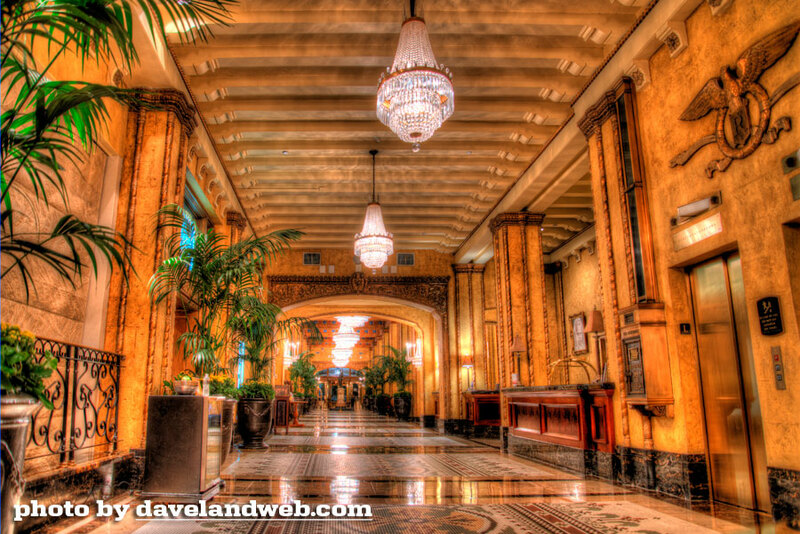 More Roosevelt Hotel photos at my main website. 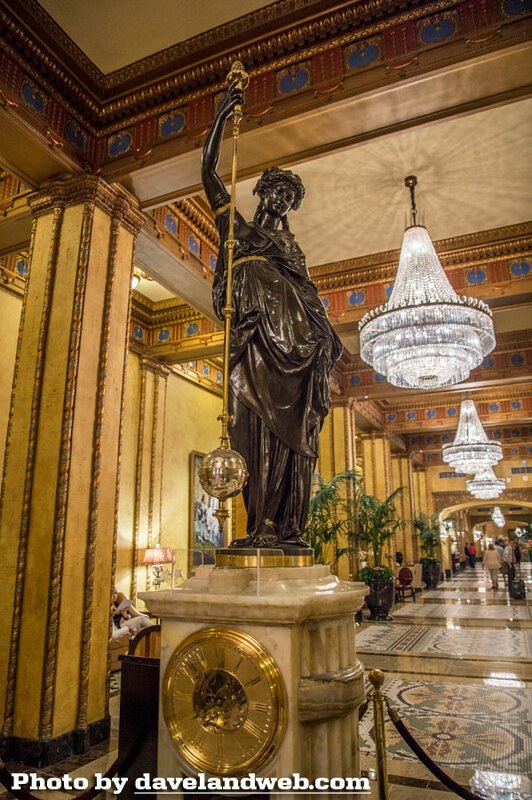 On my visit to New Orleans last Spring, I had the pleasure of staying at The Roosevelt Hotel. 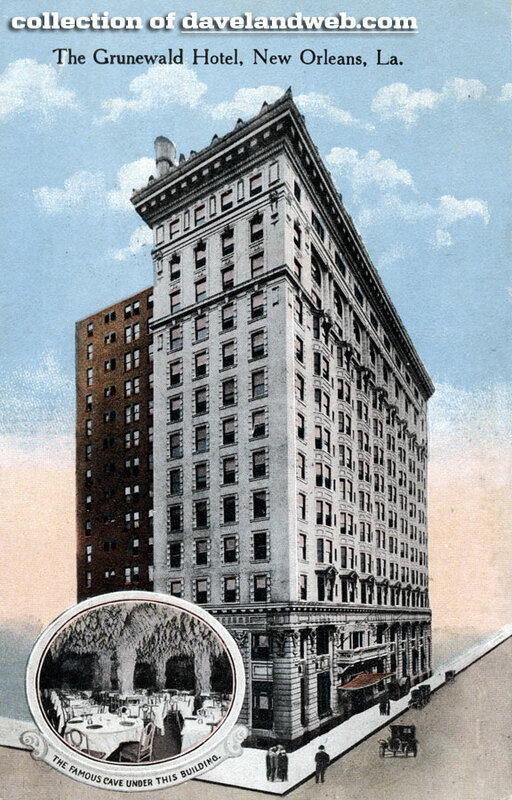 This Waldorf Astoria property began life in 1893 as The Grunewald, as seen in this vintage postcard. 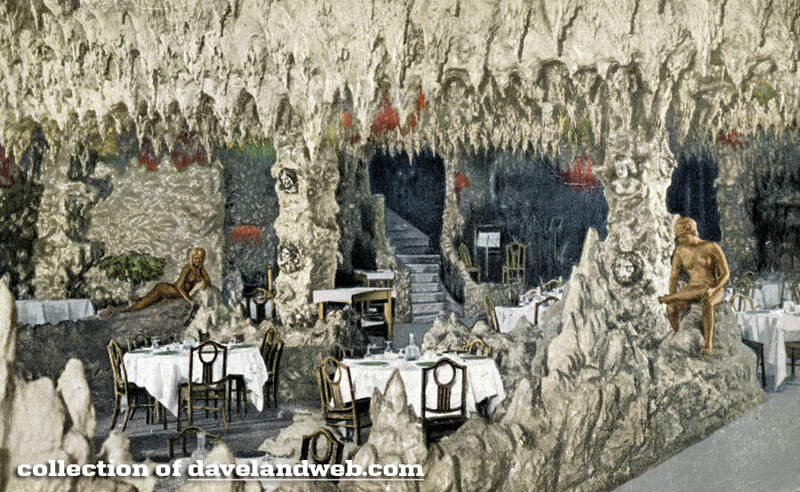 The next two images show The Cave that is featured in the inset. 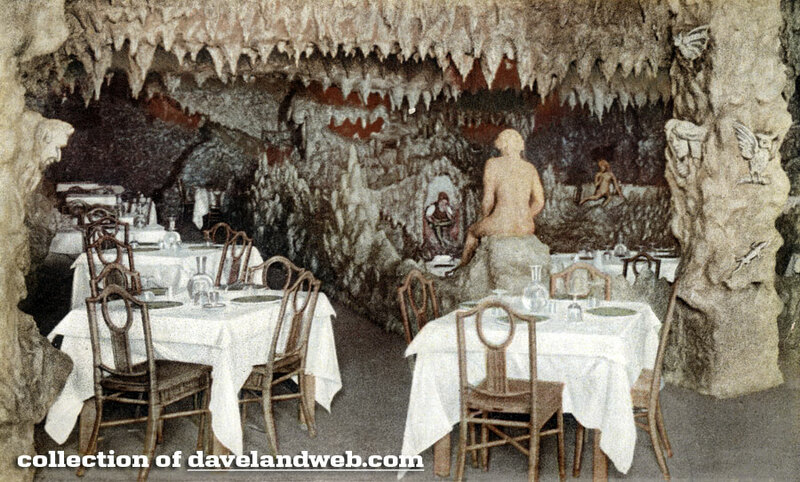 Apparently this subterranean supper club came complete with waterfalls, stalagmites, stalactites, glass topped tables and statues of gnomes and nymphs. Revues similar to the Ziegfeld Follies were presented on a nightly basis with chorus girls dancing to a Dixieland Jazz band. Unfortunately it closed in 1930. Sounds like a hoot to me. 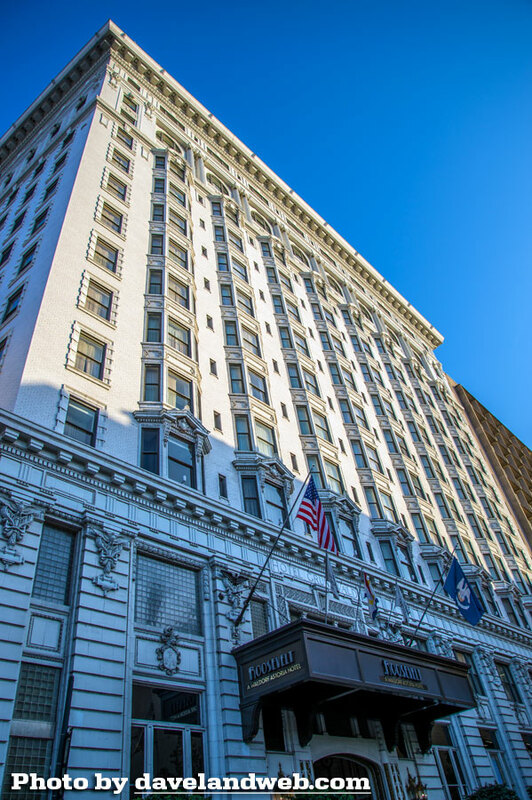 The name of the hotel changed in 1923 to honor former President Theodore Roosevelt (sorry Franklin D., not for you). 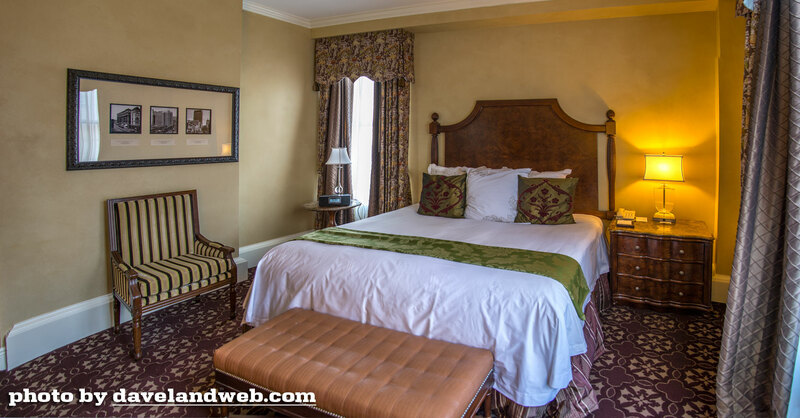 According to the hotel's website, a total of nine US Presidents have stayed here as well as the King of Rock and Roll, Elvis Presley. 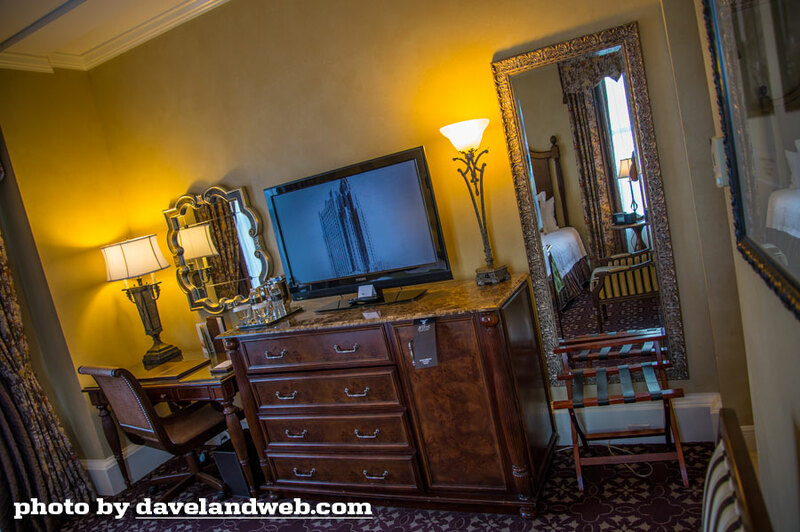 During the filming of "King Creole" in 1957, Elvis and his entourage occupied the entire top floor of the hotel. 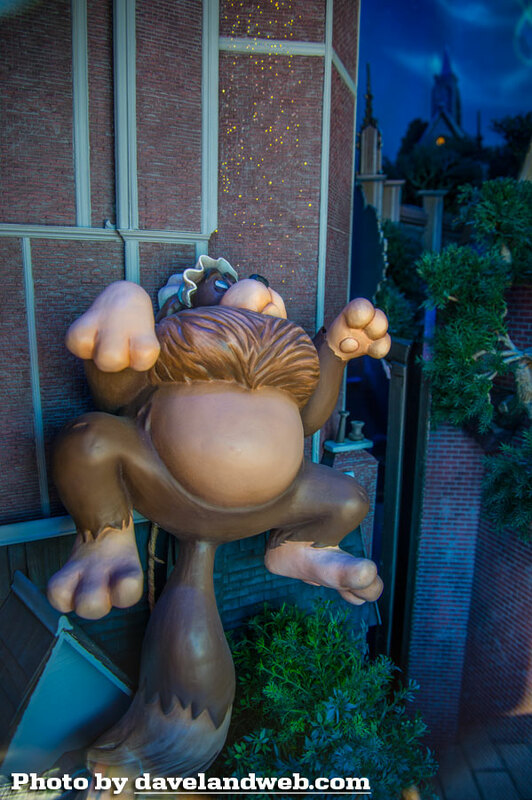 To escape the fanatical crowd below, Elvis would climb through the window of an adjoining building, cross the roof, and enter the hotel via a fire escape. 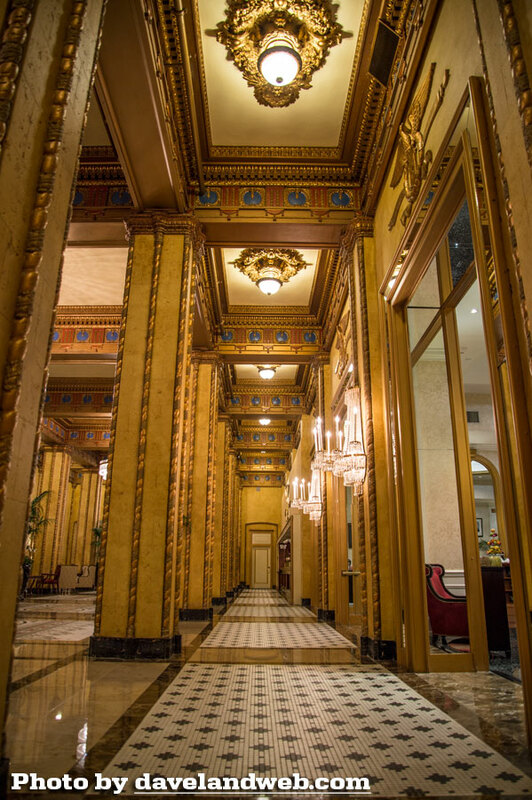 The lobby is spectacular. 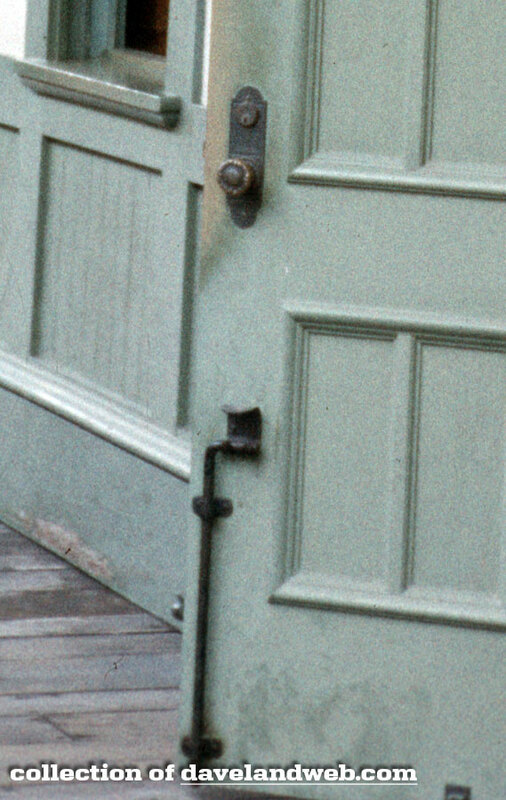 You can tell some money had been spent in the restoration of this place, as everything was immaculate. Of course every Waldorf property has an interesting clock. 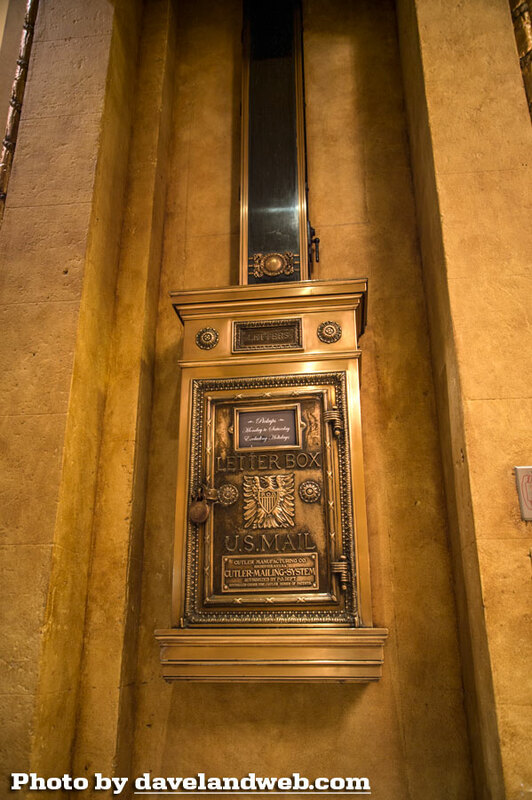 The Roosevelt has this one, known as the Paris Exhibition Clock from 1867. 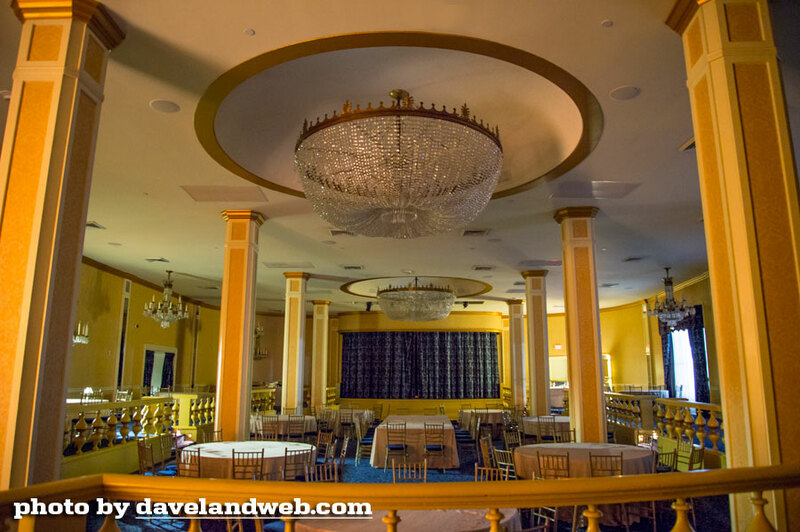 Just to the side of the entrance is the famous Blue Room, once a supper club that featured Louis Armstrong, Ray Charles, Ella Fitzgerald, and Frank Sinatra. 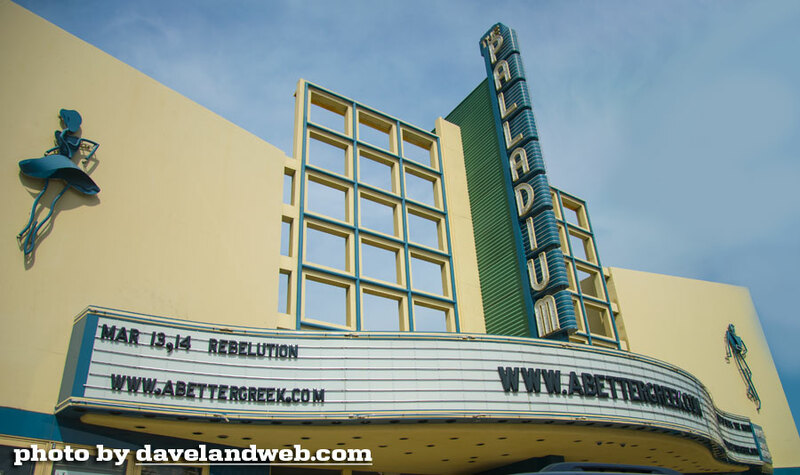 Today it is used as an event space. 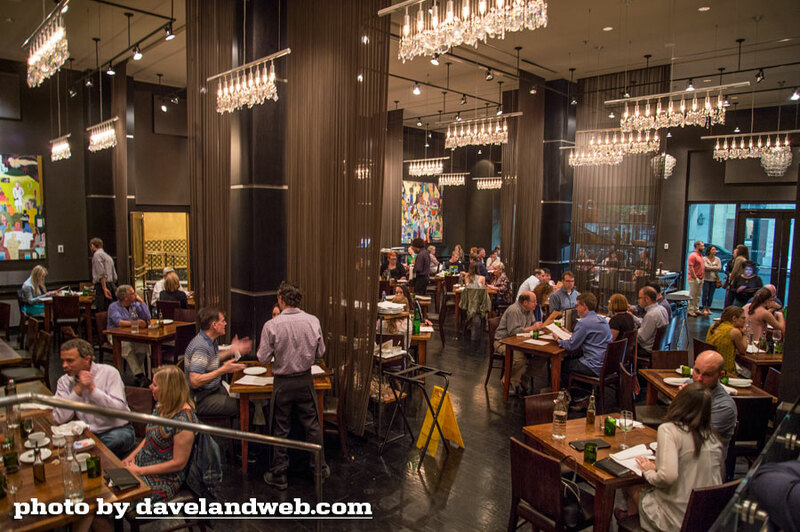 Stay tuned for more of The Roosevelt New Orleans in tomorrow's post. 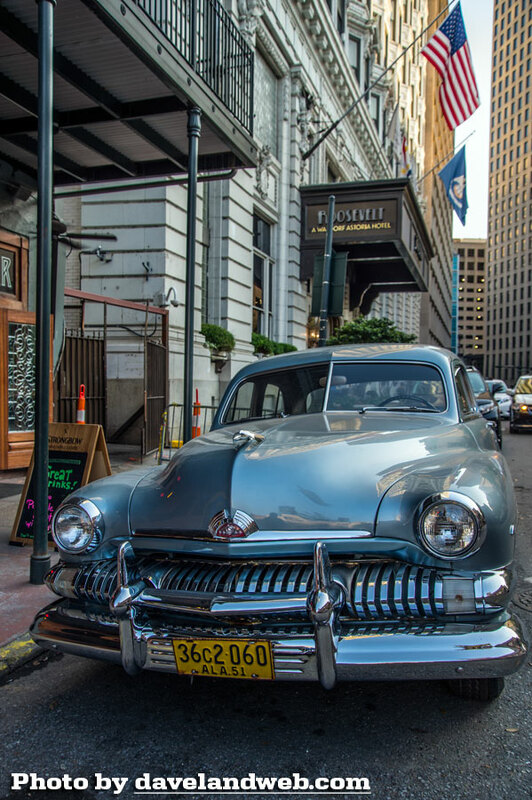 Get a more in-depth view of the Roosevelt New Orleans at my main website. Who knew? Probably some of you smart readers. Just not me. 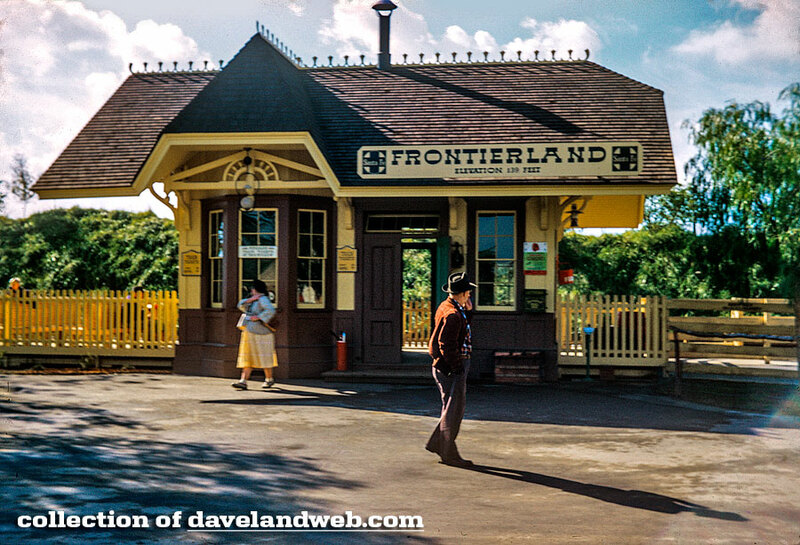 Ride the Disneyland Railroad at my main website. 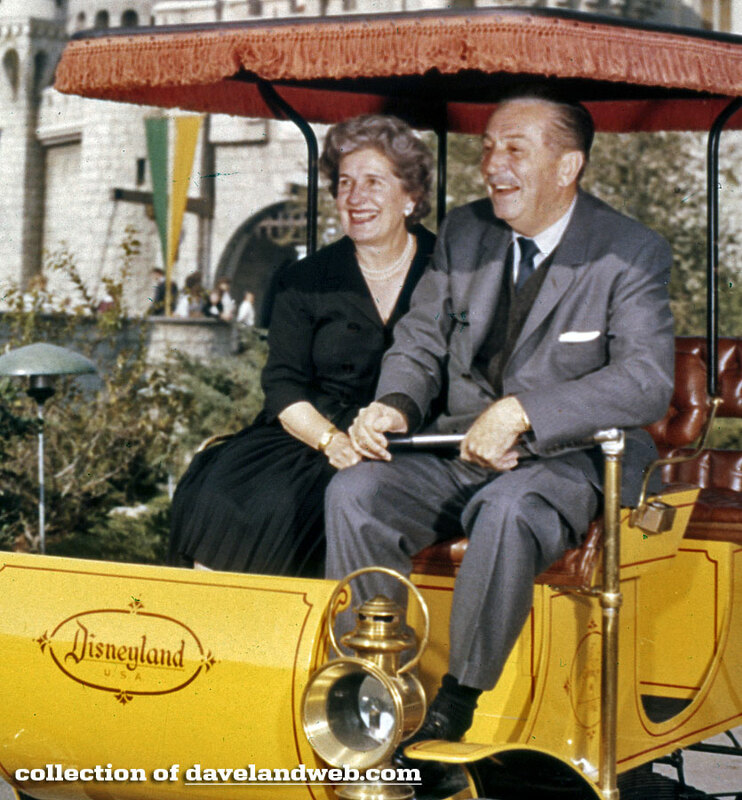 I love this photo of Walt with his beloved wife, Lillian. 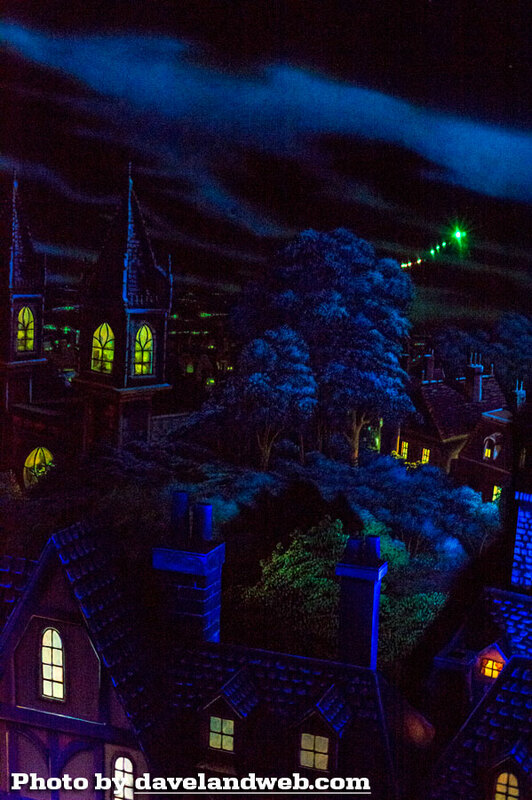 But…it seems as if it was not actually shot at the Park. 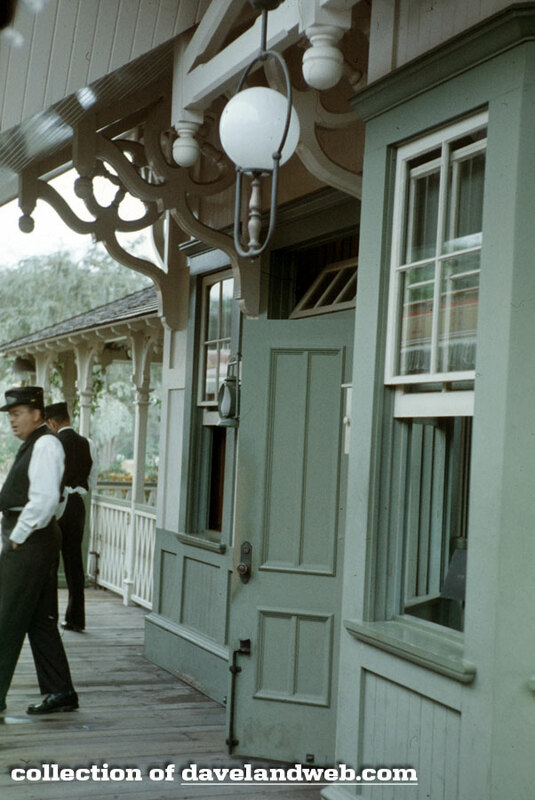 Something about the way it is lit and staged, it seems as if Walt & Lillian were actually shot elsewhere and then spliced in. I could be wrong. It happens every now and then. 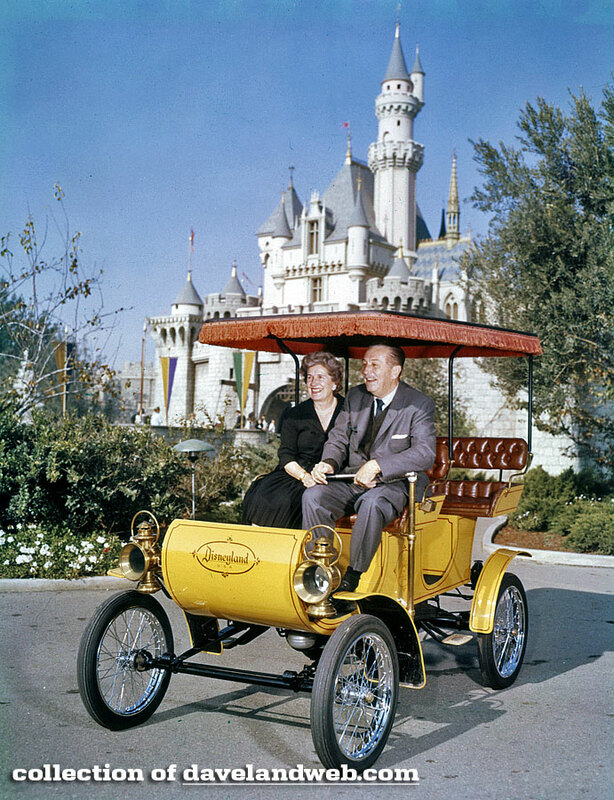 Either way, it's a beauty of the couple sitting in a Horseless Carriage with the Castle in the background. 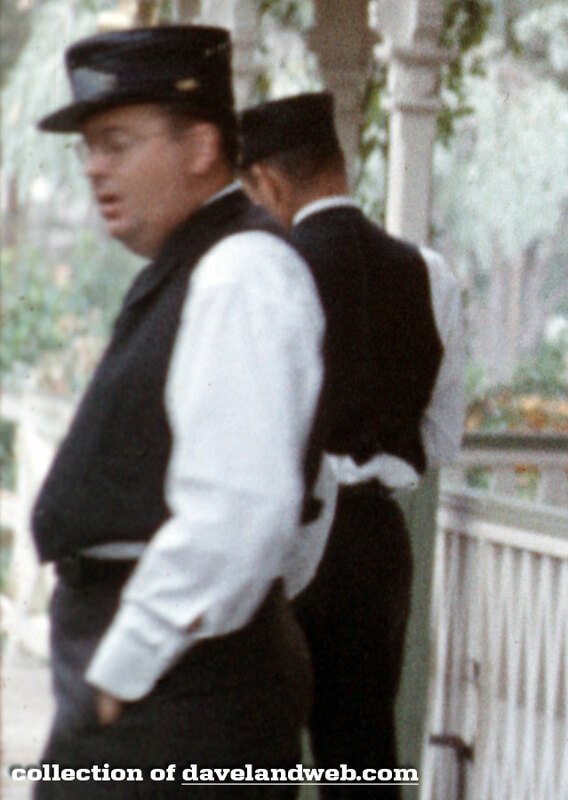 More vintage Disneyland photos at my main website. 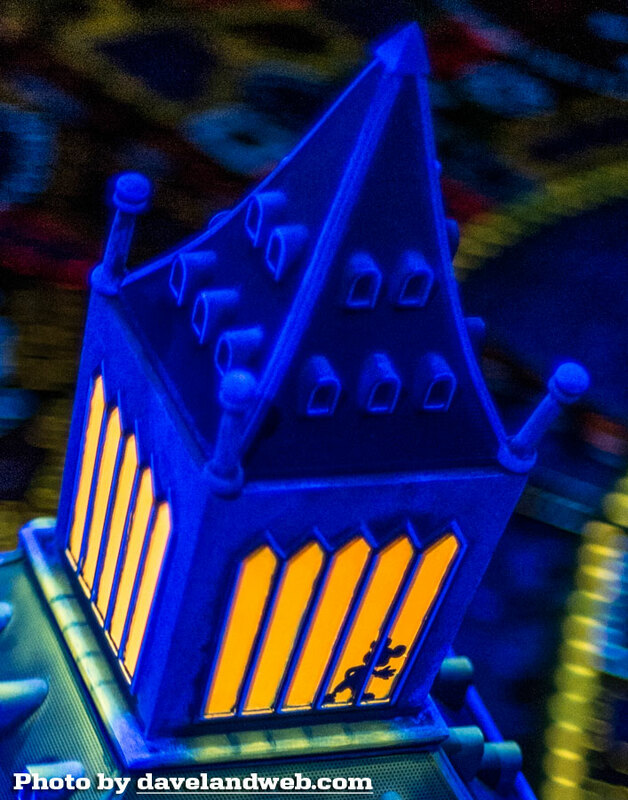 One of the highlights of the 60th Anniversary at Disneyland have been the revitalized windows of the Main Street Emporium. 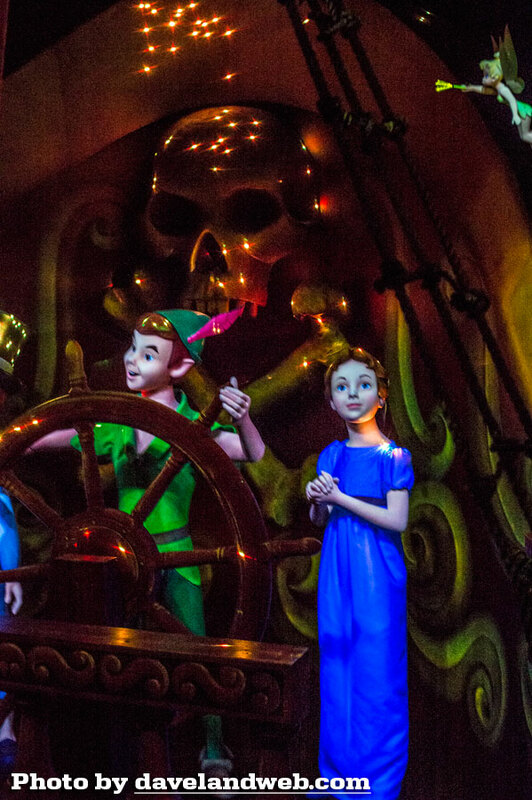 The two scenes that have been installed so far are for Peter Pan and Cinderella. 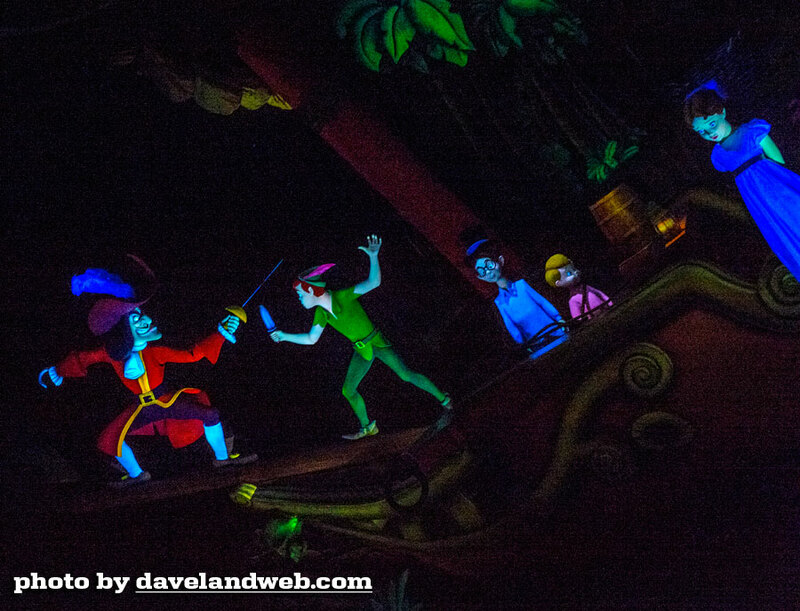 The Peter Pan scenes give a nice teaser to the attraction in Fantasyland. The star thingy in the background still baffles me; it just doesn't seem to fit. 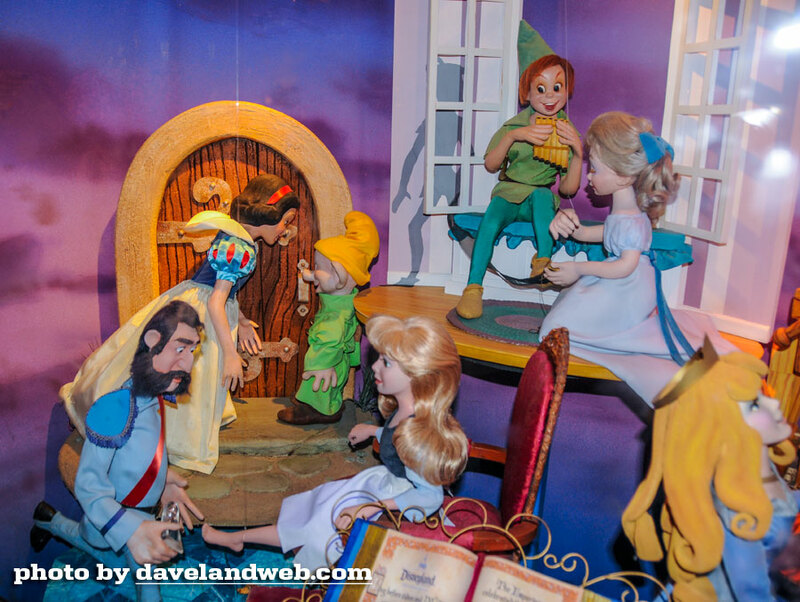 I will need to get out the original animated film to see how it matches. 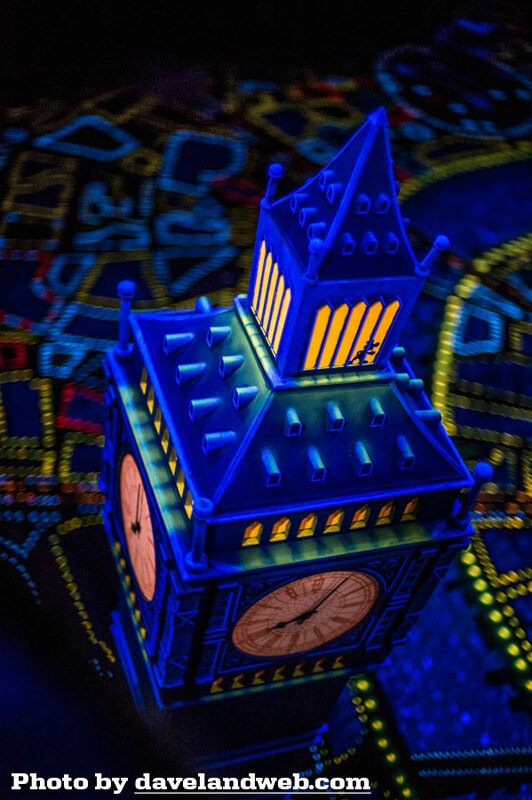 Plenty of detail to keep the eye busy as you marvel over the miniature scenes and figures. 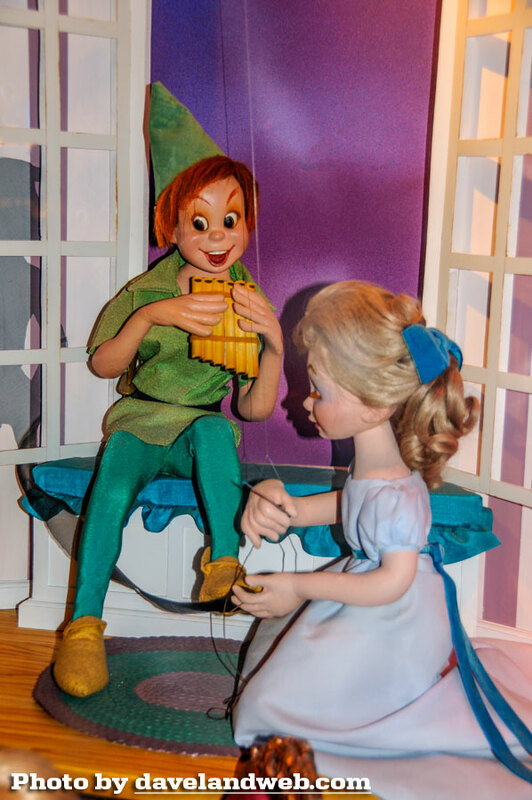 Nana the dog is not receiving much benefit from Tinker Bell's pixie dust since her leash keeps her grounded. 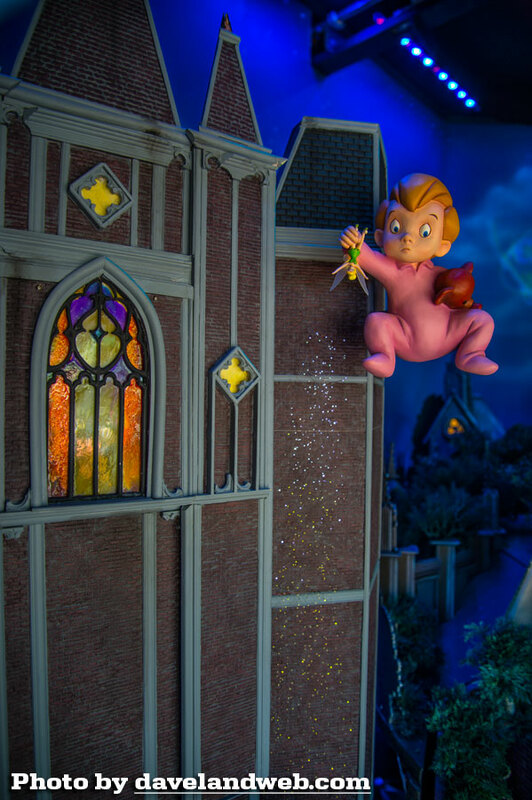 It wasn't until I zoomed in that I noticed the fiber optic lights along the wall acting as Tinker Bell's pixie dust. 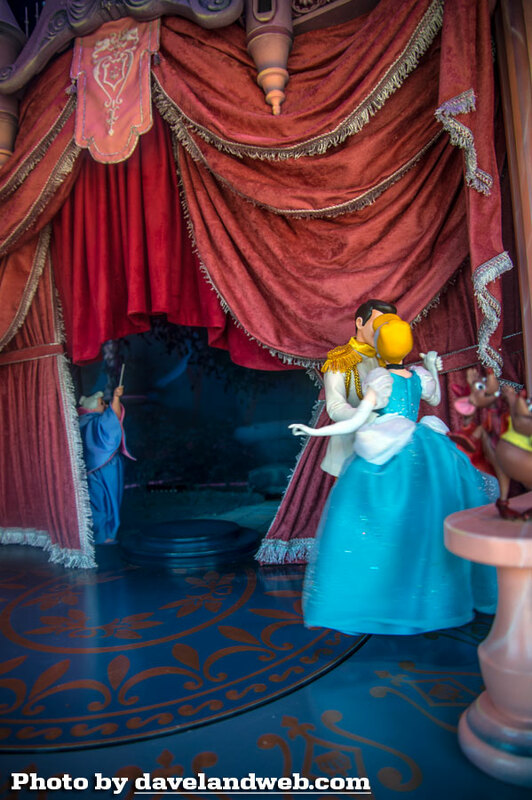 In the background, you can catch a glimpse of the alternate Cinderella scene showing Fairy Godmother transforming Cinderella into her ball gown attire. 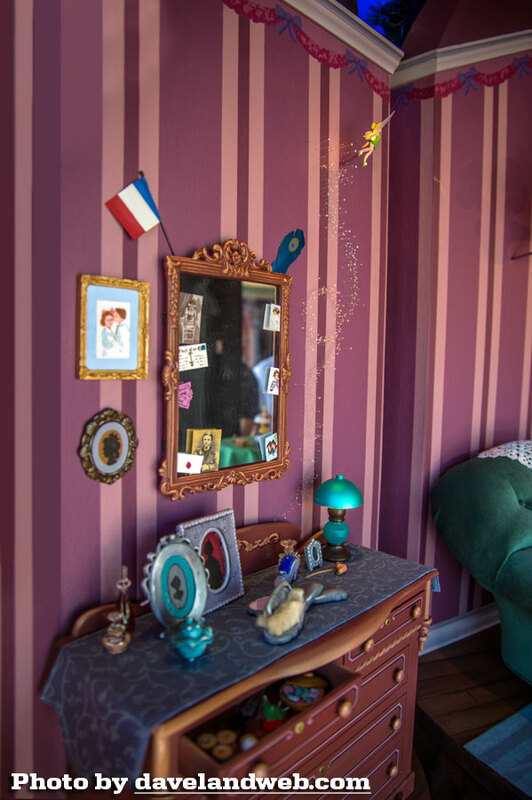 The effect wasn't working that day so I will have to rephotograph it on another visit. Overall, I think the windows are beautiful. 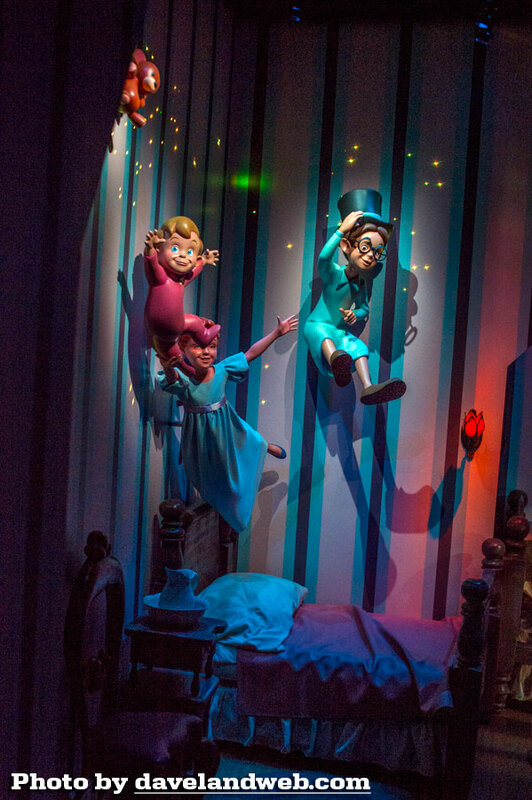 Some of the special effects may be a bit modern for vintage Main Street, U.S.A. but that hasn't stop the Disney Corporation from making other decisions so who am I to say anything. 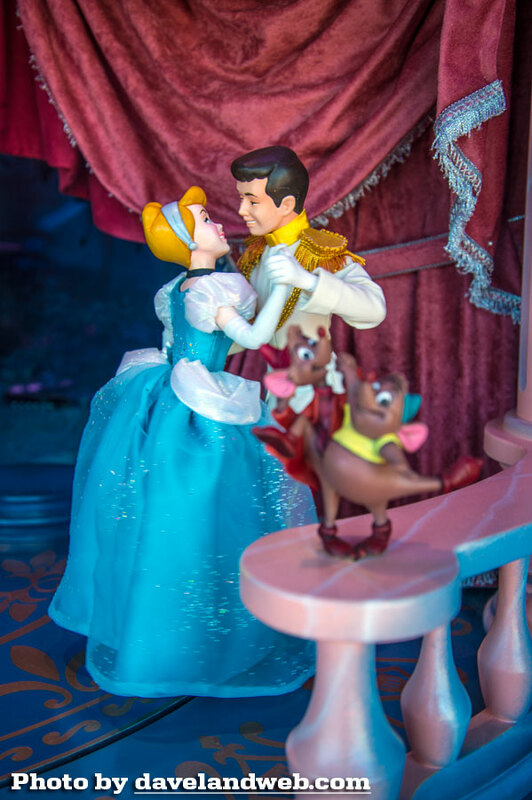 The felt figures still have their charms, though. 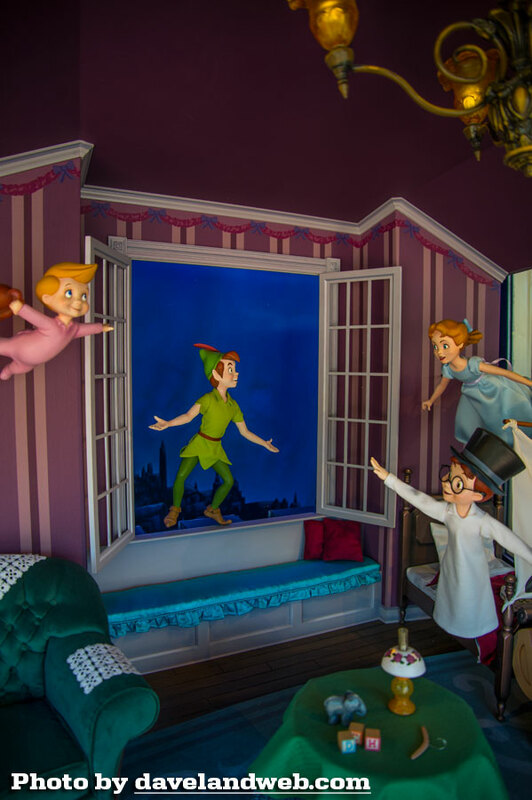 Perhaps the more whiz-bang-wow style windows would be more in place in Fantasyland and not on turn-of-the-century Main Street. Just my 2 cents. 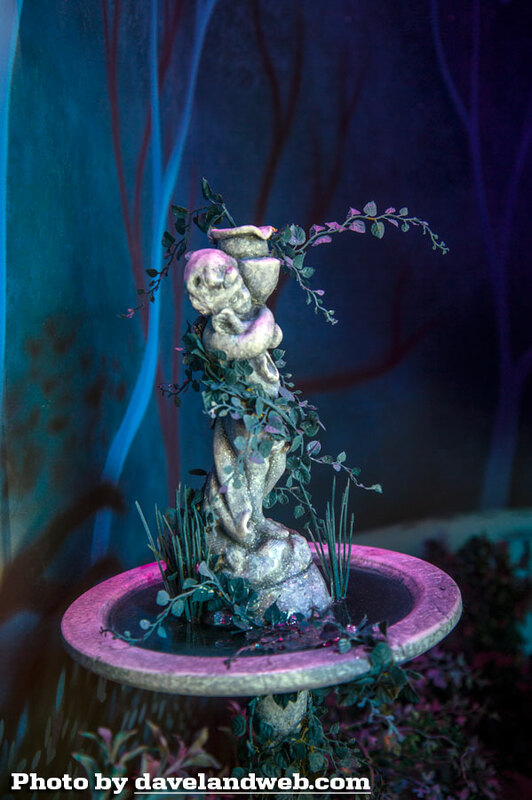 More Emporium Window photos at my main website. 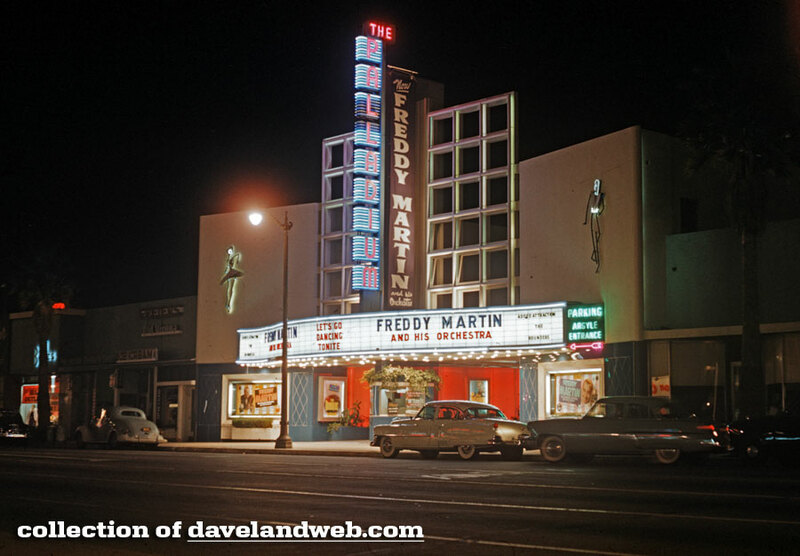 Today's image is a vintage 1950s shot of the Hollywood Palladium on Sunset Boulevard. 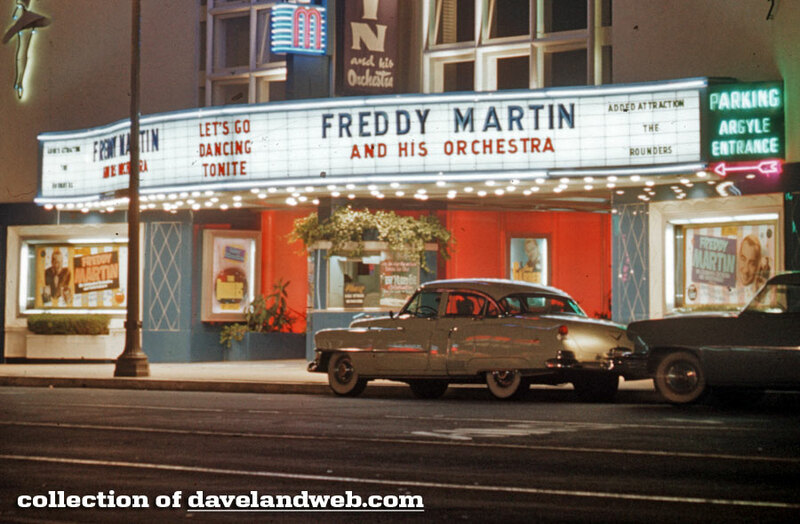 Freddy Martin and his orchestra are in da' house! 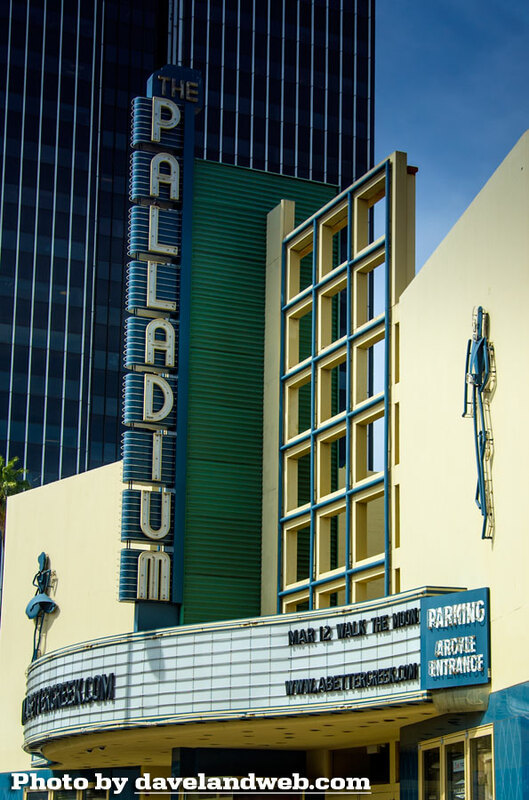 The Palladium still remains on Sunset and recently was refurbished. One of these days I'll get a corresponding night time shot for you! More Sunset Boulevard photos at my main website. 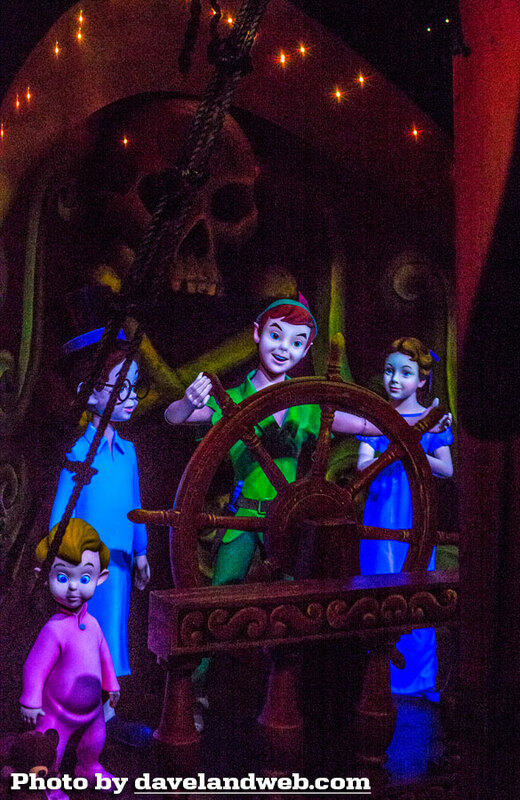 I know I am in the minority, but I was not as "wowed" as I thought I would be when I took a spin on the newly refurbished Peter Pan's Flight. 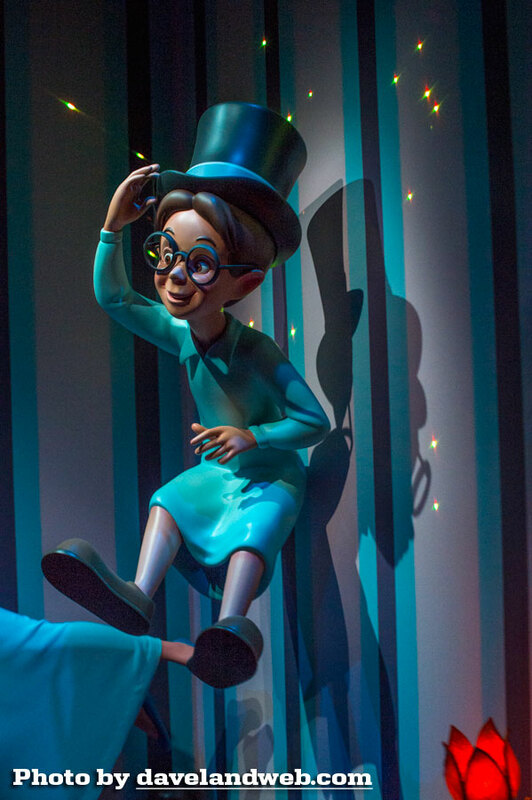 I can't quite put my finger on it, but unlike the Alice dark ride, this one just doesn't seem to have integrated the new digital effects as well. 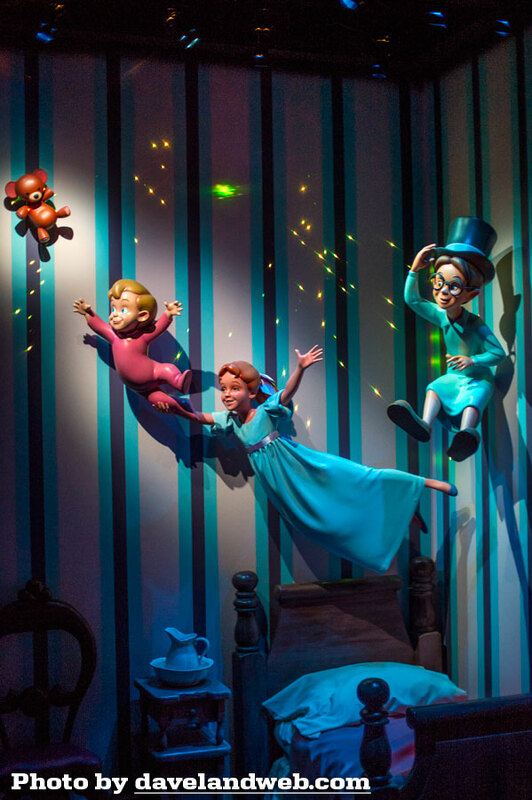 It's cool to see the pixie dust effect in the nursery, but it now makes the static nature of the children seem odd. 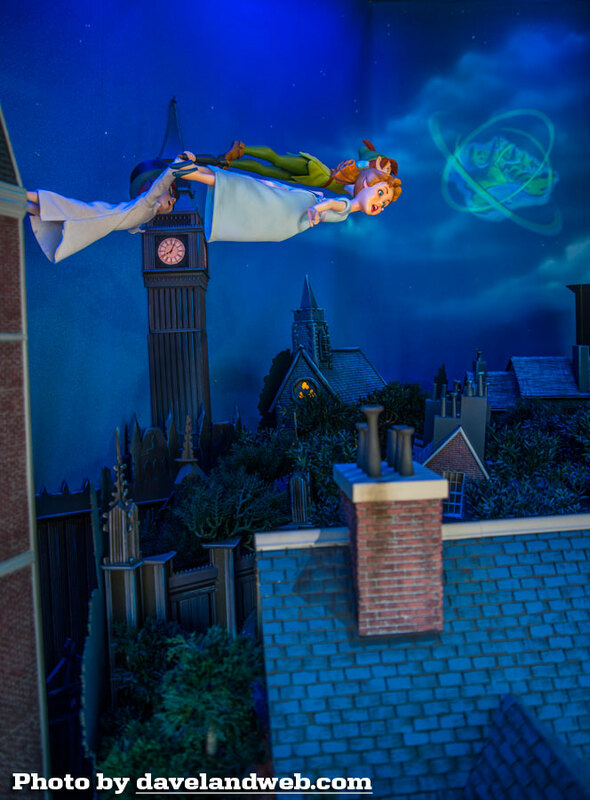 I did like how it now appears that you are following Tinker Bell's light as you soar over London. 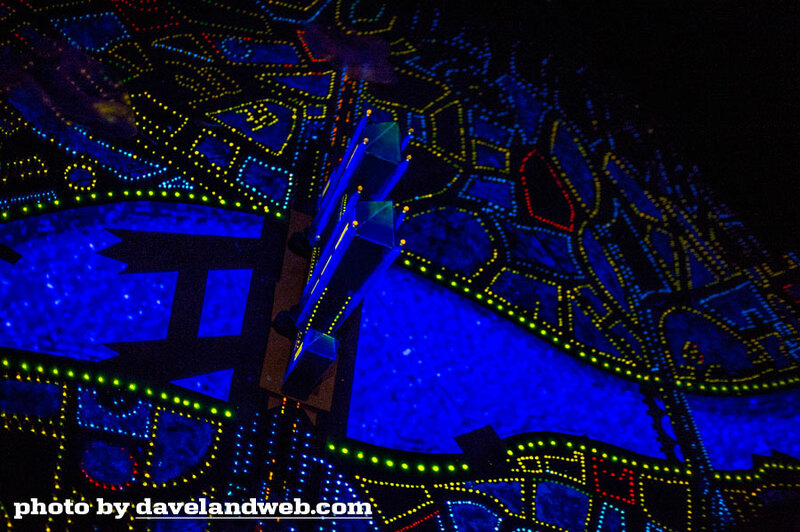 What I didn't like was how bright all of the tiny lights below seemed. 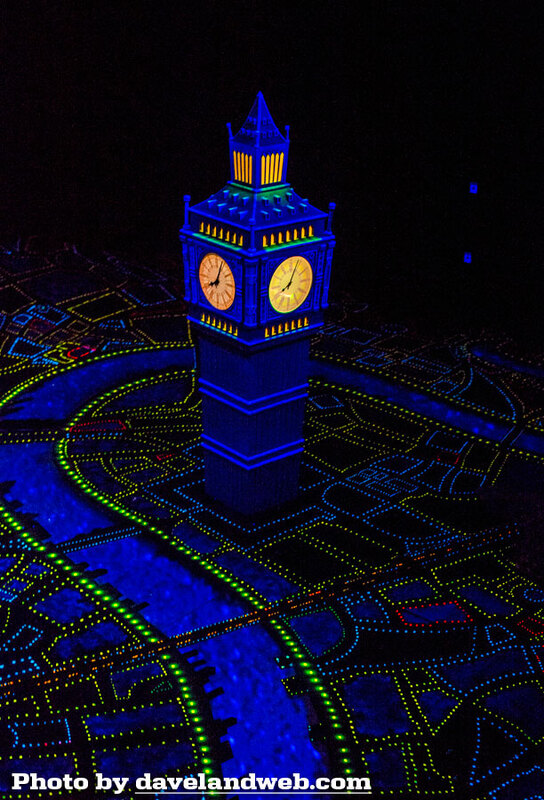 For whatever reason, it killed the magic feeling I used to get as the ship sailed over London and Big Ben. The red lights seem much brighter; what the heck at that time would show up as a bright red light in the sky? On all the lights below, it just seemed like a lot of noise. Too too much. And then there was some kind of digital effect on the wall that looked like something from Star Trek; I didn't capture it this time, but whatever it was, it just did not seem to have any place on this attraction. Call me stupid…I just didn't understand the need for it. 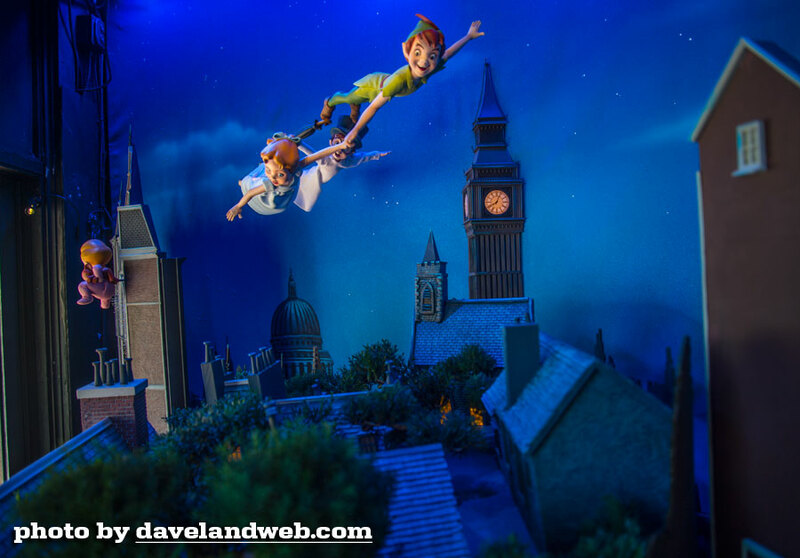 Flying over Neverland was fun though; the digital effects here are integrated in a way that is subtle and enhances the scene. 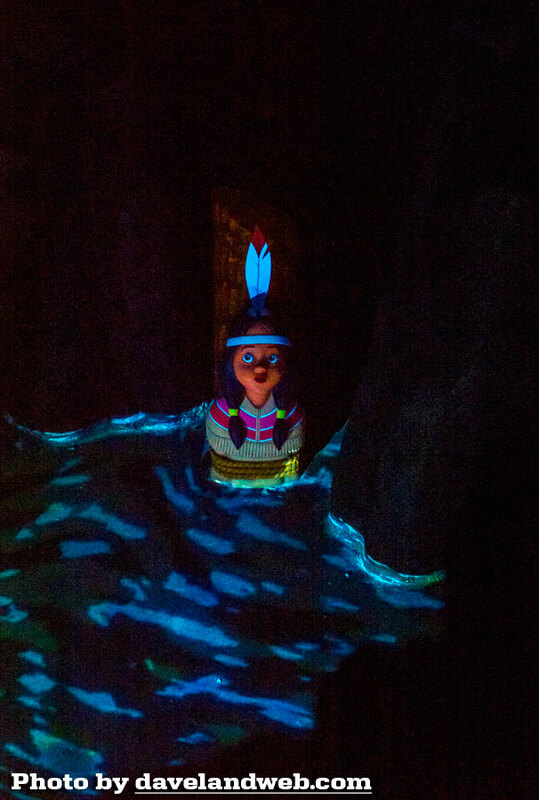 The new rippling water effects around Tiger Lily are also effective - yay! 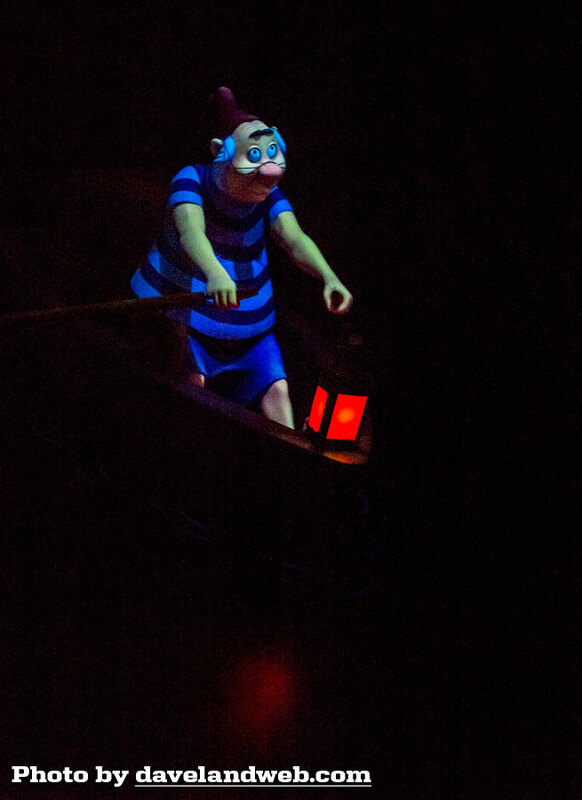 I didn't notice much new in the Walk the Plank scene. Still cool…still difficult to photograph! 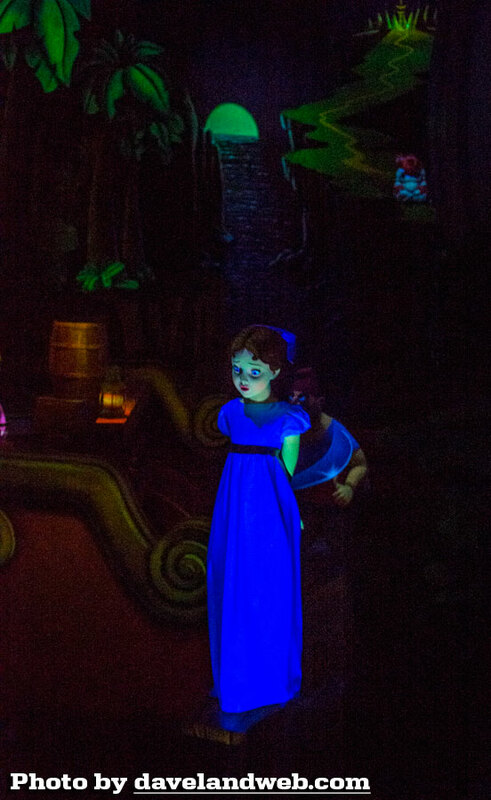 Poor little Wendy looks mighty scared. 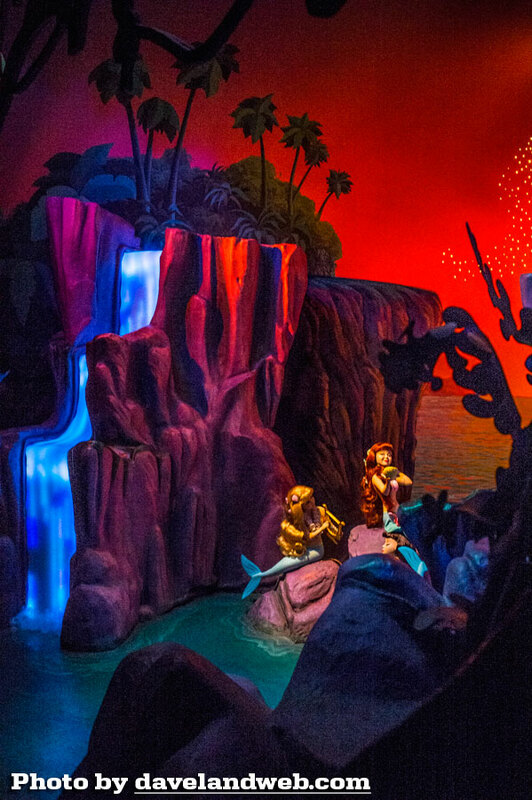 Have no fear; the gang is sailing home as soon as you round the next corner. 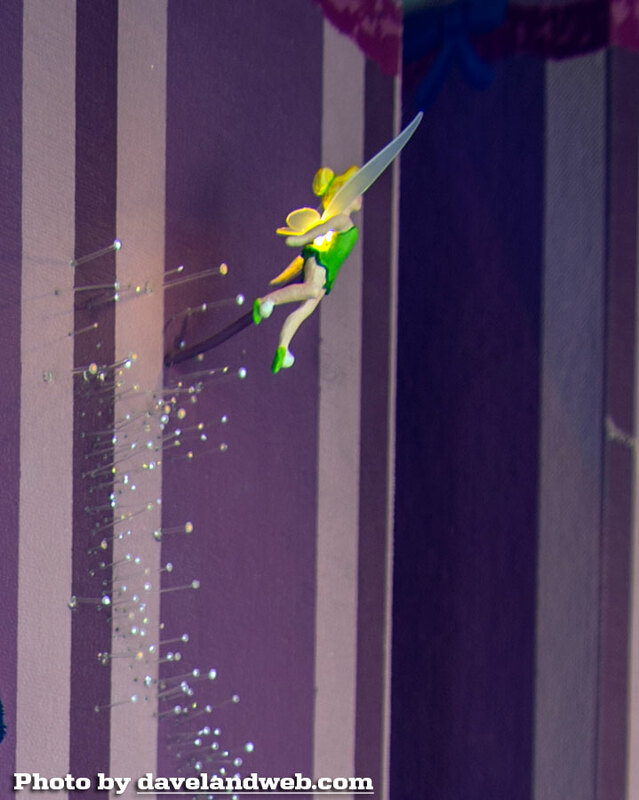 The digital effects are nice here, but the little fiber optics coming out of Tinker Bell's hand look cheap now. 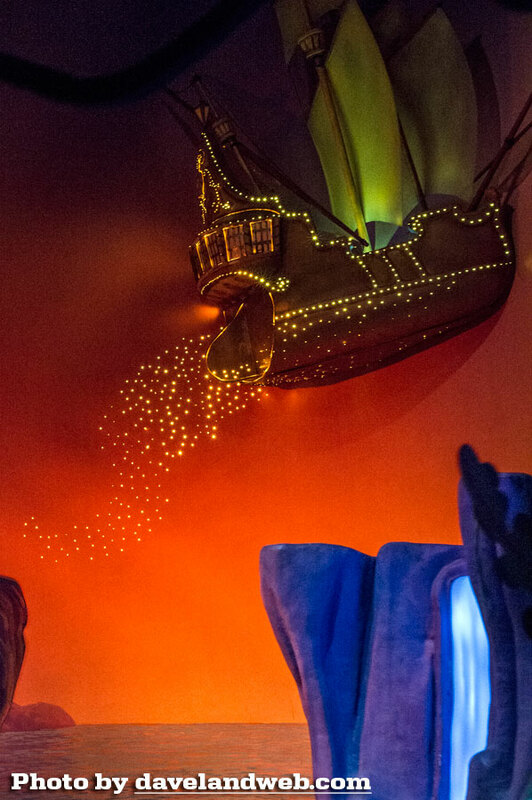 Another tough scene to catch as your ship zips by. 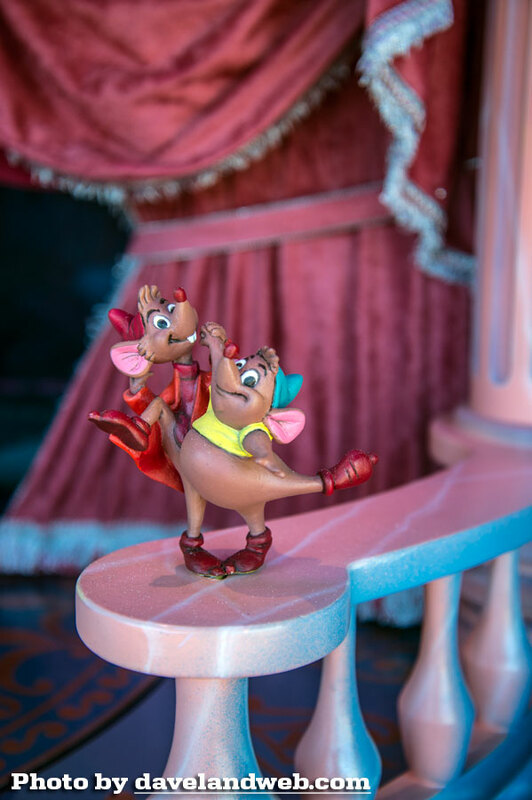 Time to invest in a new lens! 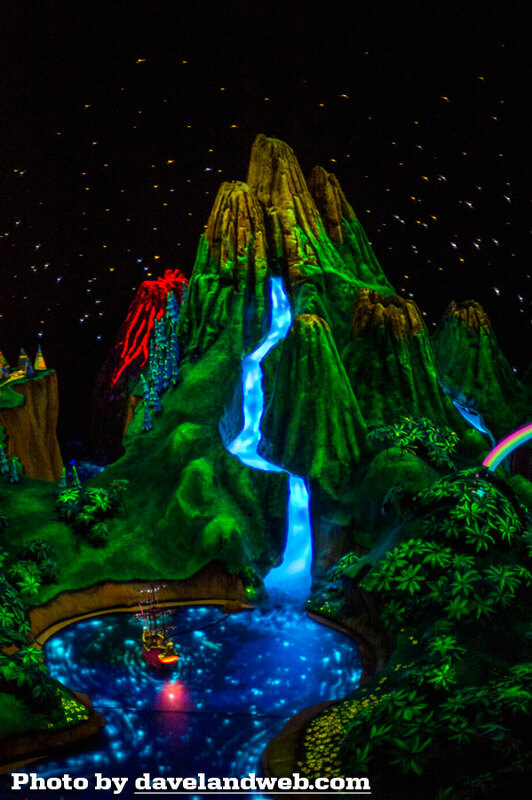 I did enjoy all the instances of the digital water. Again, I know I am in the minority. 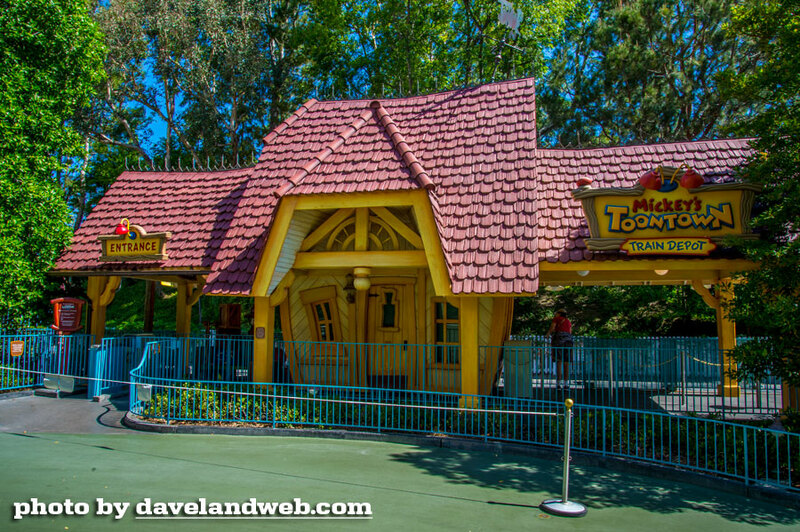 Overall it seems like most are very happy with this refurbishment. 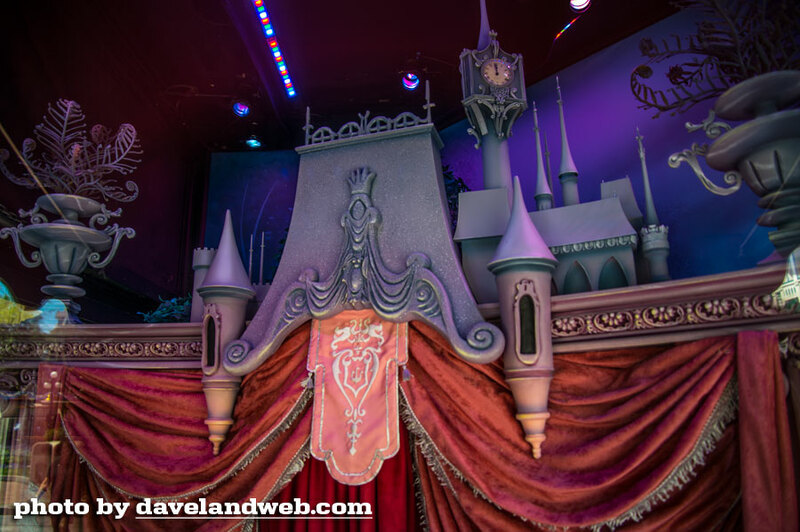 While I still rank this as one of the best Fantasyland dark rides, I would have to say that I now put it much closer to Alice and Snow White. 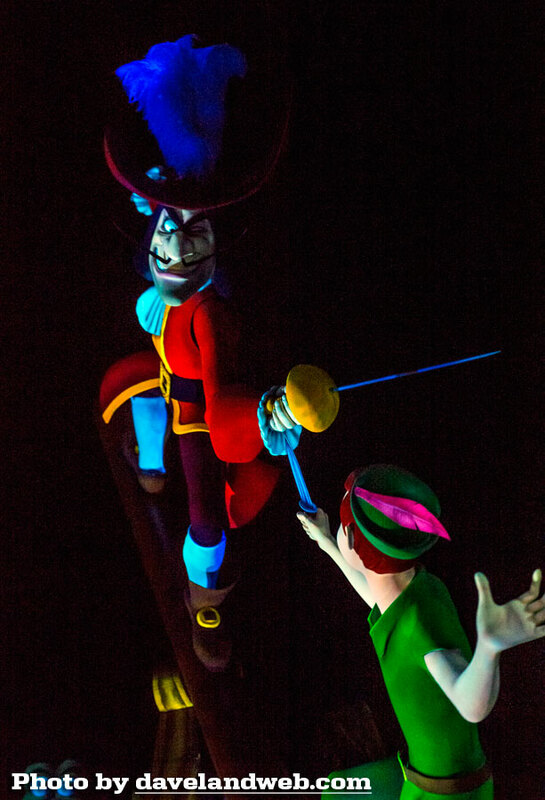 More photos of the refurbished Peter Pan's Flight at my main website. July 4th Fireworks FauxD Spectacular!